NGC1097 belongs a special class of galaxies called Seyfert – those that produce a specific type of spectrum and are thought to contain active galactic nuclei with super massive black holes. What makes this galaxy even more interesting is the very faint optical “jets” that may be the remnants of a smaller galaxy interaction many years ago. Like a lingering smear of marmalade or a trail of toast crumbs, these optical jets leave visual and photographic clues as to their origin. In a deep search for neutral hydrogen gas associated with the faint optical “jets” of NGC 1097, researchers using the Very Large Array detected an H I source coincident with a small edge-on spiral or irregular galaxy (NGC 1097B) 12′ southwest of NGC 1097, situated between two jets. In addition, two other sources are noted – but not associated with the optical jets themselves. Click here for full size color image. According to James Higdon and John Wallin; “The jets’ radio-X-ray spectral energy distribution is most consistent with starlight. However, from their morphology, optical/near-infrared colors, and lack of H I, we argue that the jets are not tidal tails drawn out of NGC 1097’s disk or stars stripped from the elliptical companion NGC 1097A. We also reject in situ star formation in ancient radio jets as this requires essentially 100% conversion of gas into stars on large scales. Instead, we conclude that the jets represent the captured remains of a disrupted dwarf galaxy that passed through the inner few kiloparsecs of NGC 1097’s disk. 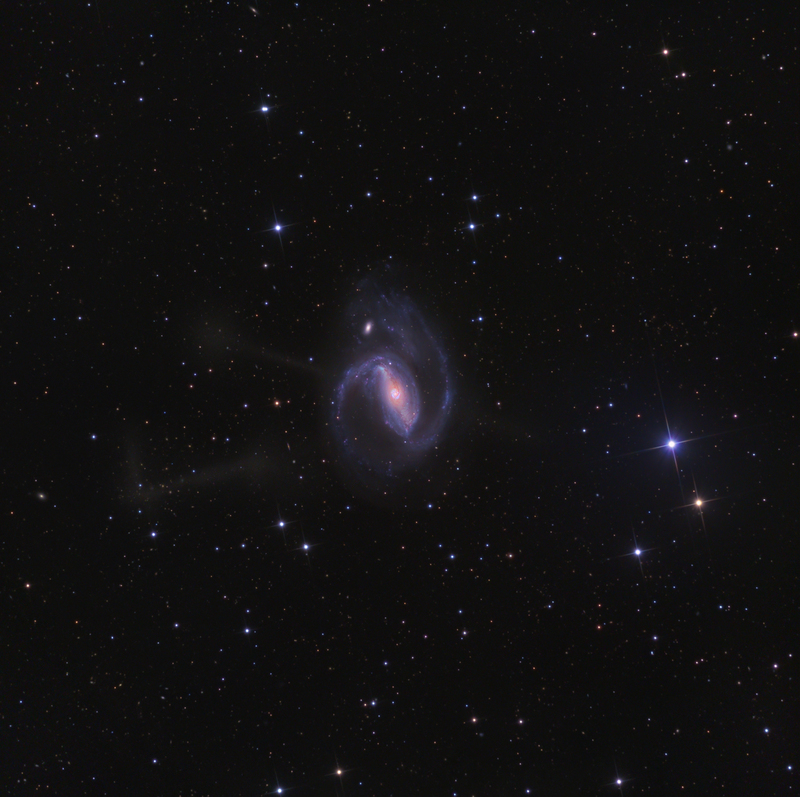 “The nucleus of the nearby galaxy NGC 1097 is known to host a young, compact (r Many thanks to NorthernGalactic member, Ken Crawford for his exclusive images. Be sure to check out Ken’s webpages at Imaging Deep Sky. Death by black hole leads to the birth of stars. Sweet. It still amazes me just how deep an image suitably equipped amateurs can create.Some of those “jet” features are hovering just above the surface brightness of the night sky. Eight more examples of extremely deep galaxy images by Ken Crawford and R Jay Gabany were recently posted in a paper online. “Stellar Tidal Streams in Spiral Galaxies of the Local Volume: A Pilot Survey with Modest Aperture Telescopes” by Martinez-Delgado (et al) feature some awesome images of galaxies like M 63 and NGC 5866 that exhibit these ultra-faint tidal features (their detection limit is ~28mag/arcsec!). A full-res version of the paper is available here: http://www.cosmotography.com/images/dmd_04242010_stream.pdf . Reading the title and seeing the picture at first, I thought this would be about an AGN with 2 pairs of jets (the relativistic ones…). THAT would be incredible, however I wonder if this is possible at all. If such a thing would be found, it would be a great task for theorists, since they have not yet figured out, how jets are formed in the first place. Nonetheless, a great article. Let’s find some food…. A key question about this galaxy (and others like it) may be as to whether there is any connection between minor mergers and AGN activity? It is posited that gas and dust has been stripped from smaller galaxies in past encounters. At the same time, it has been shown that barred spiral galaxies (like NGC 1097) are very efficient at funneling material into the central region of the galaxy via the bar. The young nuclear stellar ring tells us that vigorous star formation is presently occurring near the nucleus of NGC 1097 (nuclear stellar rings in (nearby) barred spiral galaxies are not uncommon). A scenario where gas and dust stripped from minor galaxy mergers is transported to the inner regions of the galaxy to fuel episodic AGN activity doesn’t seem too unlikely. Further study of systems like NGC 1097 may help us better understand the role (if any) of minor mergers and AGN activity in galaxies. Could it be a single dipole jet that turned on, then turned off, and then after orbital procession, turned back on again? The authors also look at other factors that point to a stellar stream origin. They note that where the two bipolar jets cross is slightly offset from the true nucleus of the galaxy and they also exhibit strong bends or kinks in the “jets”, not found in other known optical jets. They also consider and rule out jet precession and tidal streams drawn out from NGC 1097. Section 4 of the paper examines these issue and observations an is available here: http://adsabs.harvard.edu/cgi-bin/bib_query?2003ApJ…585..281H (17Mb PDF file).